There are 30,672 studs in the mosaic. 3.75 feet wide and 5.5 feet tall. It took 70 hours to complete. The parts alone would likely cost $1,000. 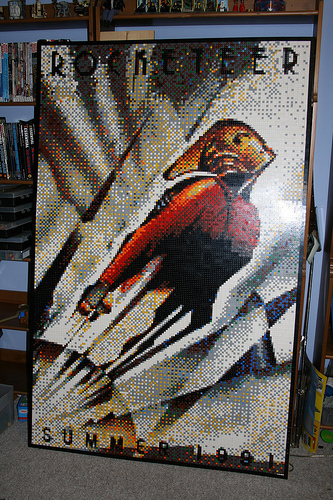 If you’re interested in how Dave created his mosaic, check out several in-progress updates and photos on the brickwares blog. Beautiful, never before have I been inspired to make a mosaic. This Mosaic is going on my favorites list for sure. The Art Deco look is captured brilliantly. Hat’s off to Mr. Ware.